10 days ago, I have started to work on the support for more cross-compilers. It’s not available in 0.7, but it should be in 0.8! I have successfully cross-built glib, babl, GEGL (and half a dozen other dependencies for these) for Android quite easily, in barely a few dozen of minutes (for Android ARM, x86, MIPS, etc.). Crossroad really makes cross-compilation just as easy as native compilation. I will make a blog post with examples on cross-compiling Glib and GEGL for Android when Crossroad 2.8 will be out (not now since I may change a few things before the release). But really… if you already know how to use crossroad for building for Windows, then it’s exactly the same for Android (except there is no pre-built package installer; does anyone know if such a repository exist somewhere?). Just give a go to the git version if you can’t wait. As always, I never develop just for the sake of it: I code because I want this for a longer term project. And I have grown interested in small devices, even though I resisted for a long time (I still barely use my phone other than for calling, and I don’t even call much). I don’t think small devices will just replace full-grown desktops and laptops any time soon (oppositely to what some would tell you), but they are definitely funny devices. So let’s have some fun in building Android (or other small devices) programs! I know, there are thousands of these “image effects” applications. Sorry! Really I just wanted a small and easy stuff based on GEGL, and that popped in my mind. For now, it’s called with the stupid name “Robogoat”, and you are free to look at the code under GPLv3. 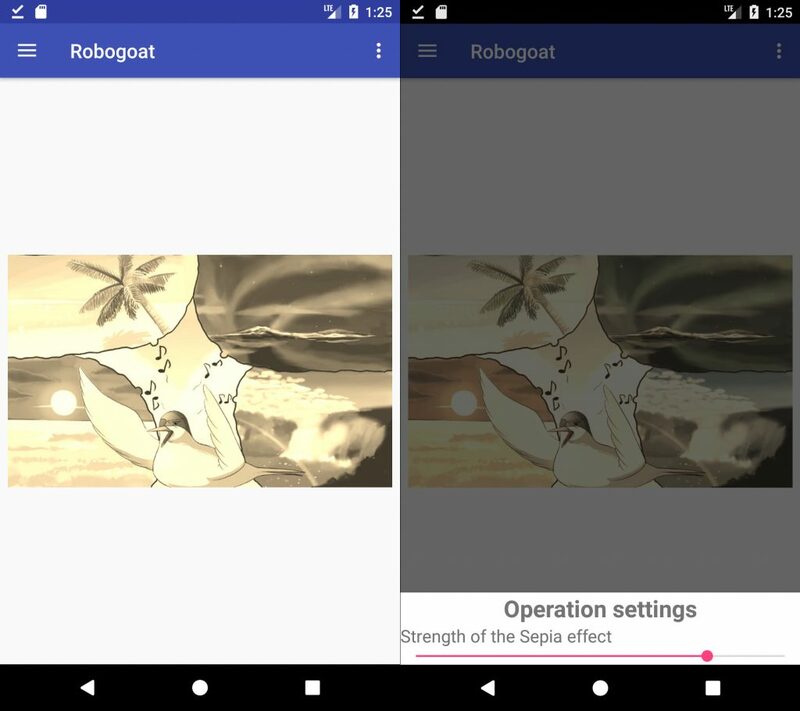 Current version only applies a Sepia effect (“gegl:sepia” operation) to test that the cross-compiled libgegl works well inside Android (it does!). When it will be ready, we should be able to select any effect from a wide range of GEGL operations. So if you want to support me, you can fund my FLOSS development in US dollar (on Patreon) or in euro (on Tipeee). Thanks!